I love plain roasted almonds, but sometimes I crave something with a little more pizazz. Flavored almonds from the store can be good, but they’re often overwhelmingly salty, not to mention expensive. So, I decided to come up with my own recipe for spiced roasted almonds. What I ended up with is a simple recipe that might be just a little too good. I can’t stop eating them! When thinking about flavor combinations, I knew I wanted a balance between spicy, salty, and sweet. So I pulled out some cayenne pepper, fine grain sea salt, and a packet of stevia, which I’ve been using more and more often lately when I need to add a touch of sweetnes. But I couldn’t decide what to add for extra flavor. 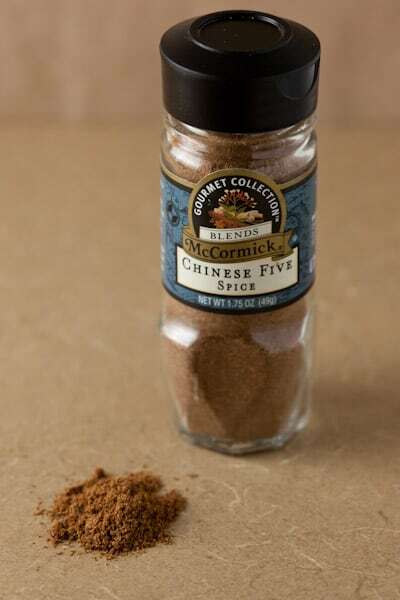 I started searching through my spice cabinet and came across this bottle of Chinese Five Spice. The moment I opened it and took a whiff, I knew I had found the perfect flavoring for my almonds. The five spices included in the McCormick Gourmet blend are: Anise, Cinnamon, Star Anise, Cloves, and Ginger. It is commonly added to stir-fry dishes, marinades, and meat sauces, but the warm spices also lend themselves well to desserts like these Chinese Almond Cookies. The spice blend was perfect on my almonds, and I definitely achieved the flavor balance that I was looking for. I have been chosen by McCormick to participate in the McCormick Real Gourmets program. I have been paid by them and I received a big box full of McCormick Gourmet spices. I have been using McCormick Gourmet for years, and am thrilled for the opportunity to explore more of their spices and blends. I used McCormick Gourmet Chinese Five Spice and Ground Cayenne when creating this almond recipe. 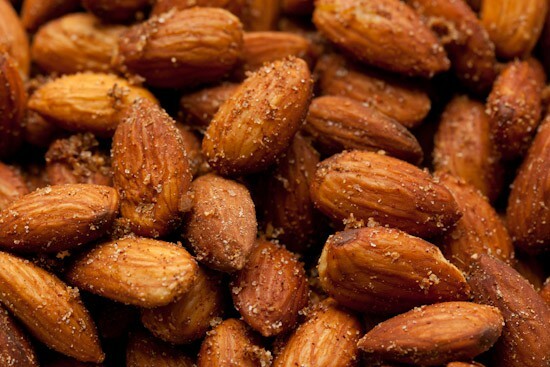 In a large bowl, toss the almonds with the olive oil. 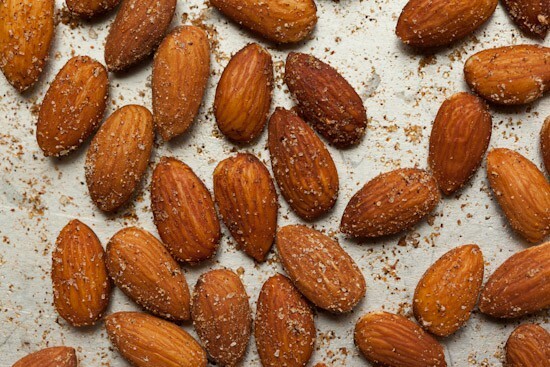 Spread almonds out on a sheet pan in a single layer. (Keep the mixing bowl handy – you will need it again.) While oven heats, mix the spices, salt, and sugar (or stevia) in a small bowl; set aside. Bake almonds in a preheated 350 degree oven for 10 minutes. Remove pan from oven and carefully pour the hot almonds back into the mixing bowl. Sprinkle spices over the nuts and toss well with a spoon. Pour the seasoned almonds back onto the sheet pan and return to the oven for 5 minutes. Remove from oven and let nuts cool completely on pan. Store cooled nuts in a covered container. Ha! Great minds think alike--I made something very similar in December for holiday gifts. Mine were called Sweet & Five-Spicy Almonds, and used honey & sriracha. They are SO GOOD. These look so good. I love the added benefit of how healthy they are. I really like roasted almonds too. These sound great. Great idea to try the Chinese 5 Spice. I love roasted almonds that have a little kick to them and the mixture of spices in the spice mix sound wonderful. great flavor combo! Love it! I'm thinking that this recipe might also be wonderful with cashews. Can't wait to try it both ways! We love almonds and I have some 5 spice in the cabinet. Going to make these ASAP! What a gorgeous picture! I'm not a big fan of plain whole almonds but these look quite amazing! Almonds have such great nutritional value that it's wonderful to find such a tantalizing recipe! Both simple and tasty! Thanks for posting this. I love the idea of warm ginger on toasted almonds. Great post! I have NOT tried a chinese five spice seasoning. I love asian flavors so this is must try for me. I'm certain I would not be able to stop eating this. Great snack. I have been a long-time fan of this spice blend. Didn't even think to season my almonds with it! What a great idea! I am off to make this now!By the way, I put this spice blend in my oatmeal cookies, in my biscotti dough and on my Asian-inspired oven-fried chicken tenders. Very popular at my house! Mmmm I just made these on my lunch break and brought them to work. BIG HIT! I doubled the cayenne and used splenda. I've made this as written and tonight I tried making one batch with a Moroccan spice mix and another batched with a spice mix to blacken steaks. All three turned out great.Next I think I'll try cinnamon sugar or Old Bay. Those look really good! And it reminds me of an encounter I had a few months ago in the store. A woman was frantically looking for Chinese Five Spice. She couldn't find it and asked if I knew where it was. We both looked and couldn't find it. Then she asked if I knew what it was made of and sadly I had to tell her that I didn't have a clue.Oh well. Better late than never! ; ) I'll have to get this seasoning. I have McCormick's Ground Cardamom and I'm using it on everything now. I used it on rice pudding last night. Loved it!